How much snow fell on Niseko in 2011 & 2012? Was it a normal season in Niseko? The locals, ex-pats and snow clearing companies say that the same amount of snow falls in Niseko each year, with a standard deviation of around 10%, not bad when the average is 14m. Predicting when the big snow storms will hit is difficult, will it be the start, middle or end of the season? Just to keep the area around our snow station clear we moved 490m³ of snow! Our regular readers will know we logged the snow fall every morning in Hirafu village during the 2011/2012 winter and our total is 15.3m, that’s outside the front door! We started measuring on 15 November 2011 and finished on 9 April 2012. During those 147 days the snow did not fall for only 27 days. That means it snowed 94.5% of the winter! December was the biggest month with 5.1m in total, January and February weren’t bad either with 4.2m and 3.5m respectively. How much snow fell higher up the mountain? We have read through all of the Niseko Avalanche Information posts and noted the largest snow fall figure they published each day. This comes to an incredible 16.3m of snow fall. 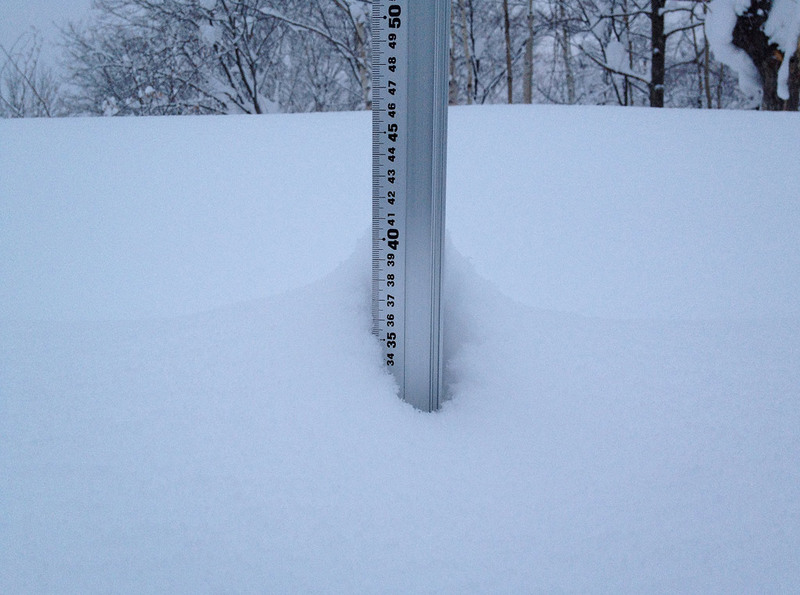 If you want to know when the snow first falls on Niseko in late 2012 and get our daily snow reports for the 2012 2013 season, just like us on Facebook or follow us on Twitter to get the best reports first? Guess we shouldnt have gone in early March this year! January and February are the guaranteed powder months. Accommodation is cheaper in December and March, but you don’t get the daily dumps…unless it’s a freak season like the one just past where we get the massive December dumps.